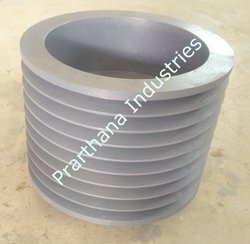 We are a leading Manufacturer of heavy duty v belt pulley, v groove pulley, v belt taper lock pulley, v belt pulleys, belt pulley and belt drive pulley from Ahmedabad, India. Minimum Order Quantity 10 P.I.P.G. 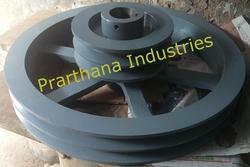 CI Heavy Duty V Belt Pulley in Multiple Groove"Z" Section, "A" Section, "B" Section, "C" Section, "D" Section, and "E" Section"SPZ" Section, "SPA" Section, "SPB" Section, "SPC" Section200mm Diameter to 2000mm Diameteras per Standard or as per DrawingWith and Without Taper Lock Bush. CI V Groove Pulley in Single and Multiple Groove"Z" Section, "A" Section, "B" Section, "C" Section, "D" Section, and "E" Section"SPZ" Section, "SPA" Section, "SPB" Section, "SPC" Section50mm Diameter to 2000mm Diameteras per Standard or as per Drawing With and Without Taper Lock Bush. 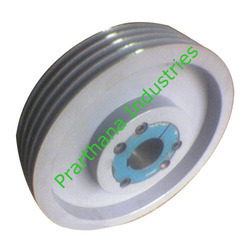 CI V Belt Taper Lock Pulley in Single and Multiple Groove"Z" Section, "A" Section, "B" Section, "C" Section, "D" Section, and "E" Section"SPZ" Section, "SPA" Section, "SPB" Section, "SPC" Section50mm Diameter to 2000mm Diameteras per Standard or as per DrawingWith Taper Lock Bush. CI V Belt Pulley in Single and Multiple Groove"Z" Section, "A" Section, "B" Section, "C" Section, "D" Section, and "E" Section"SPZ" Section, "SPA" Section, "SPB" Section, "SPC" Section50mm Diameter to 2000mm Diameteras per Standard or as per Drawing With and Without Taper Lock Bush. CI V Belt Pulley in Single and Multiple Groove"Z" Section, "A" Section, "B" Section, "C" Section, "D" Section, and "E" Section"SPZ" Section, "SPA" Section, "SPB" Section, "SPC" Section50mm Diameter to 2000mm Diameteras per Standard or as per DrawingWith and Without Taper Lock Bush. 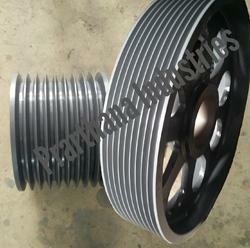 CI V Belt Drive Pulley in Single and Multiple Groove"Z" Section, "A" Section, "B" Section, "C" Section, "D" Section, and "E" Section"SPZ" Section, "SPA" Section, "SPB" Section, "SPC" Section50mm Diameter to 2000mm Diameteras per Standard or as per DrawingWith and Without Taper Lock Bush. CI D Section V Belt Pulley in Single and Multiple Groove"Z" Section, "A" Section, "B" Section, "C" Section, "D" Section, and "E" Section"SPZ" Section, "SPA" Section, "SPB" Section, "SPC" Section50mm Diameter to 2000mm Diameteras per Standard or as per DrawingWith and Without Taper Lock Bush. CI V Belt E Section Pulley in Single and Multiple Groove"Z" Section, "A" Section, "B" Section, "C" Section, "D" Section, and "E" Section"SPZ" Section, "SPA" Section, "SPB" Section, "SPC" Section50mm Diameter to 2000mm Diameteras per Standard or as per DrawingWith and Without Taper Lock Bush. CI V Belt Machine Pulley in Single and Multiple Groove"Z" Section, "A" Section, "B" Section, "C" Section, "D" Section, and "E" Section"SPZ" Section, "SPA" Section, "SPB" Section, "SPC" Section50mm Diameter to 2000mm Diameteras per Standard or as per DrawingWith and Without Taper Lock Bush. 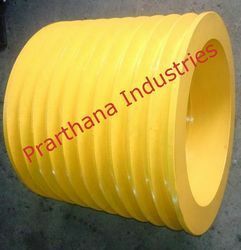 Casting Pulley in Single and Multiple Groove"Z" Section, "A" Section, "B" Section, "C" Section, "D" Section, and "E" Section"SPZ" Section, "SPA" Section, "SPB" Section, "SPC" Section50mm Diameter to 2000mm Diameteras per Standard or as per Drawing With and Without Taper Lock Bush. 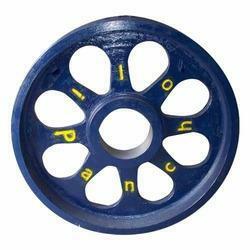 Looking for V-Belt Pulleys ?